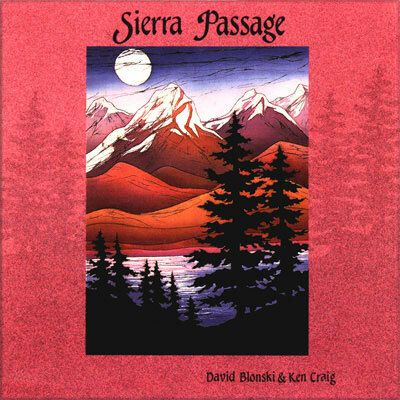 Sierra Passage – With roots firmly planted in contemporary folk music this recording by David Blonski and Ken Craig, explores the realms of musical impressionism by drawing inspiration from the spirit of the early pioneers of the west and the land that they settled. The beauty and majesty of the Sierras are exquisitely captured as various folk traditions and cultural heritages are expressed. Experience the magic of the California wilderness as this unique musical recording fills the air with a sense of enchantment. We begin our story on a gray and rainy day as someone looks out a window at the crowded streets below. Feeling a yearning, we are transported to a realm of “Raindreams”, where new horizons are opened to us. As the sky clears, a “Falling Star” streaking across the night sky to the west is our sign… and so we embark. Even though our hearts are sometimes saddened about the things we must leave behind, the expectations of what lies ahead quickens our steps and lifts our spirits as we reach the “Crossroads”that lead us ever onward.. Along our way we are greeted by the glory of nature as represented by the “Cascade” of an unspoiled and wild river, and we feel cleansed and refreshed as we stand in it’s mists. We are not alone in our journeys, and on Side Two we meet some of our fellow travelers. As we greet the morning at a “Washoe Sunrise”, we visit those who have long respected and revered our mother, the Earth. With eyes and heart open, we learn a great deal from “The People” who lived here long before the white man. Later we come across an Appalachian family in their wagon as it plods purposefully onward on the “Trail West”. We see hope and great expectations etched in their faces. Arriving at the west coast we encounter the people who poured in from the orient who tirelessly worked to build a place in the West. With shovels and picks they helped build the roads and railways. Many of these people stayed but many returned home hunched over, not so much from the hard work in the gold fields, but rater from their heavy loads of “Jade”, the sacred stone of peace, health and prosperity that was so scarce in their homelands. Then from the south came the ranchers and mission builders whose Spanish and Indian blood mixed to begin a whole new culture. These people came not for gold but for the “El Dorado” that was the richness of the land itself. Yes the road west has been traveled by many and the pilgrimage still goes on today as thousands continue to make their “Sierra Passage”.